Attachment. It’s about how we connect with one another. It’s about moving away to explore in the world in developmentally appropriate ways for our age and stage of development and moving back in to connect when we need it. It’s about responsiveness as a parent. For example, a baby learning to crawl may explore on the other side of the room and then move back into mama or papa’s lap to reconnect. As the parent, we create the space for our little one to move away and explore and welcome them back into our arms when they return. We’re they’re secure base. An 8 year-old may go to a friend’s house for a little while without you there and then need to reconnect when you’re reunited. They may literally crawl into your lap, or walk over and touch you on the shoulders or want a hug. Our job as parent is to create the space for them to move into the world as they’re ready in steps that aren’t too big for them and to be there when they return to hear what it was like for them. And that means hearing their feelings, too. An 18 year-old may leave home to go to college or to do a gap year to travel, but they can connect with you via phone or Skype or even come back home if that’s what they need. Your job as parent at that point isn’t to tell them what to do, but to listen, help them move through their feelings about whatever happened that was difficult and help them find their own way, knowing that you’re there. Responsiveness from the people we love and who love us is important no matter how old we are. Maybe this isn’t what it looks like in your family. Maybe this isn’t what it looked and felt like for you growing up. Many years ago, I read Alfie Kohn’s book, Unconditional Parenting. I loved it. I nodded and agreed with every word. I wanted to be that responsive, understanding parent. But I had no idea how to do it. I had no idea how to get there from where I was at that moment in my relationship with my son. It’s a process. It’s surrounding yourself with other like-minded parents who are on a similar journey. It’s about finding good information that supports your journey. I want to make sure you know about the resources that are available to you here. 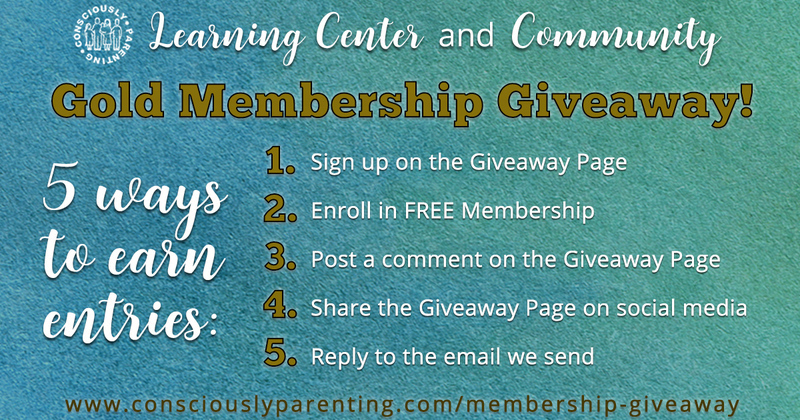 See below for information about our new Learning Center AND our Membership Giveaway. And make sure you listen to this month’s podcast about Attachment with Tracy Cassels of Evolutionary Parenting. Whether you’ve got a little one or an older child, there’s information here for you to support your connected parenting journey. We’re making the shift to a once a month newsletter. We’ll be sharing some inspiration, a few of our favorite blog posts and podcasts along with any important sales you need to know about. We’re putting our energy into creating more resources for you, so you’ll just be receiving a monthly newsletter from us, starting today! Want to hear from us more often? Sign up for a membership below for additional support, resources, and community. You can still decide how often you hear from us, but you’ll have access to our library of resources and support for parenting from a conscious place in between our monthly newsletters. If you’ve been looking for ways to engage more in this paradigm of parenting from a conscious place, and long to have other parents you can connect with, resources you can rely on and dive into on your own time, and monthly support calls to help answer your parenting questions, we’ve got something just for you! Want to test the waters and see what this is about? Join our FREE level where you can access a library of free Consciously Parenting resources, interviews, and podcasts. Come back often as we continue to add more! We have more support at different price ranges, starting at just $10/mo. For the month of July, we’re having a SALE on our GOLD Membership with full access to everything in the Learning Center, plus 3 live support calls per month! We’re extending the sale through Tuesday, August 15 at midnight eastern. Use coupon code SUMMER2017 for $10/off per month. Click here to learn more about The Consciously Parenting Learning Center and Community. We’ve filled our first 8 cabins with lovely families and just opened our second set of 8 cabins. Check it out and see if joining us is right for you and your family! Check out these great blog posts and podcasts! July’s Podcast series was with Christy Farr, The Unruly Woman, about Boundaries. We talked about the proverbial “Uncle Bob” and how to handle a well-meaning relative or friend with respect for both ourselves and the other person (Part 1 and Part 2). We end the series by talking about respectful boundaries with our kids, and then in Episode 12 I shared my own story of why I gave up punishment. Join us! Okay, let’s be real. A car full of kids, including one that can’t sit still for an entire movie, an adolescent boy, a hormonal teenager, and two tired parents does not make for a great road trip across the country. Perhaps, it would be a fantastic movie, one of those disaster movies that you can’t help but groaning out loud because it is so painful and funny. It was no movie; however, it was my summer holiday adventure . . . a MONTH-LONG road trip across the country. I did it and I survived. Click to continue reading. Having dinner with my aunt recently forced me to revisit my boundary issues. You know the boundaries I am talking about, the lines that should be drawn in situations you aren’t comfortable with, like say uprooting your family of five to help someone else with their vacation plans. Click to continue reading. From the Consciously Parenting Archives: Whenever I ask a group of parents what they want for their children, the topic of respect inevitably comes up. Parents want their children to be respected, but parents also want to feel respected by their children. Many parents grew up not feeling respected themselves and most parents, it turns out, grew up having at least one experience (most had many experiences) of not being respected by an adult in their life. Click to continue reading. Click here for more on the blog. 5/22/2017 Weekly Newsletter: What is your family culture?